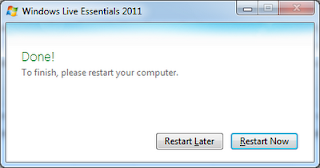 Microsoft just released their Live Essentials suite of software downloads for Vista and Windows 7 machines. I've been using them since January 2009. Here are my thoughts. You shouldn't install them all, first of all. 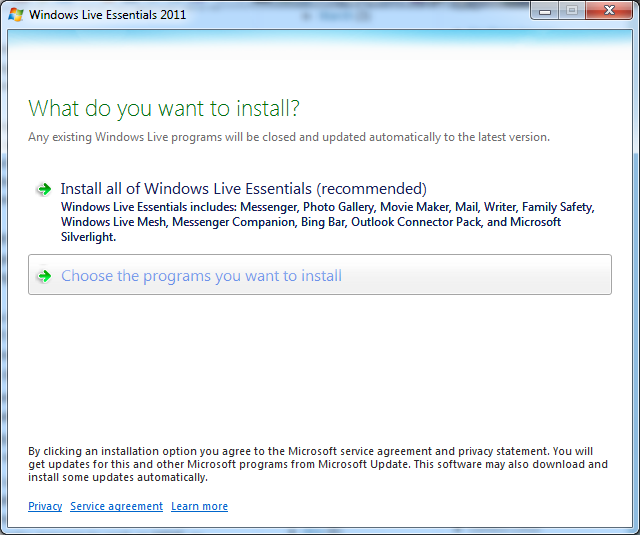 When you download and run the installer, you get the choice to install everything, or pick and choose. Make the latter selection. If you have a previous version of something, they won't give you the choice not to upgrade, so if there's something you don't want to install, quit the installer and uninstall it first. 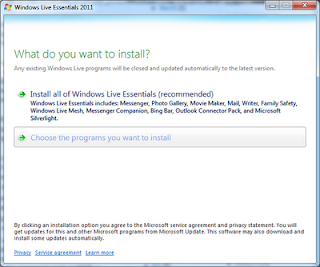 Which programs in particular to install will be an individual choice. 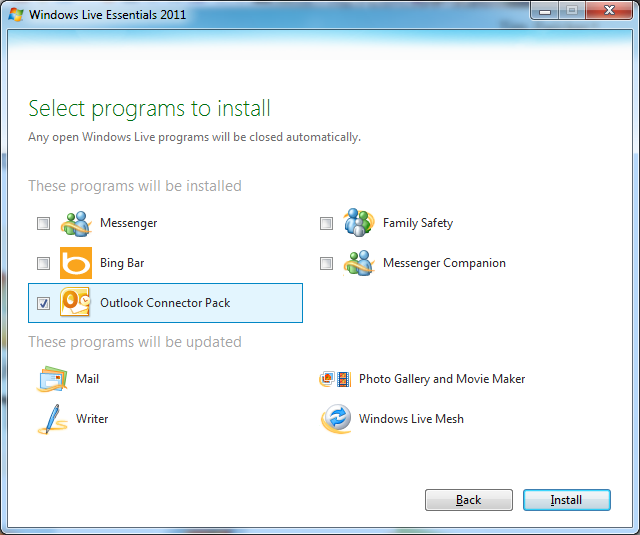 I already had Mail, Writer, Photo Gallery, and Windows Live Mesh installed from the beta. 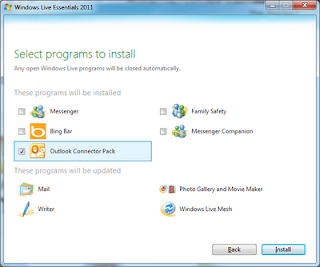 I had installed Microsoft Office since last updating the software, and so the installer offered me the "Outlook Connecter Pack". I'm not sure what it is, but it probably won't hurt. 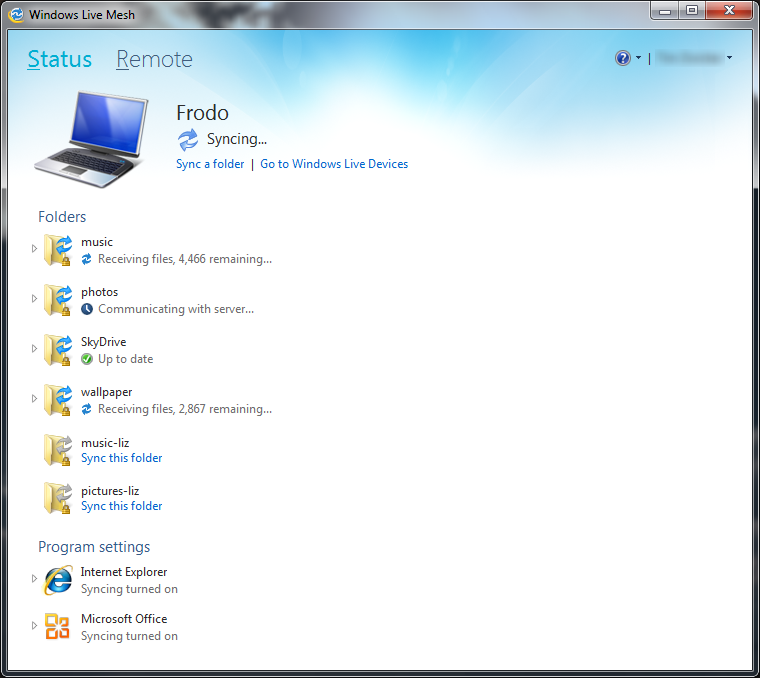 Speaking of hurt, though, unless you really, really want it, don't install the Bing Bar. It's just a bad idea. It will try to take over all of your browsers, and seriously, who needs a toolbar in their browser? I've never tried the updated Messenger, Messenger Companion, or Family Safety. I hardly ever use my hotmail account to chat, and I use Pidgin when I do, so I don't really have a use for the Messenger enhancements. Writer is apparently a very good blogging tool that works with a lot of popular blogging sites (like Blogger, which hosts this blog), but so far, I've stuck with the web interface for composition. Microsoft doesn't upload your files to its servers, but it does keep track of them for you. Any change you make to your shared folders gets copied to the other computers where that folder is synced, and the copying is peer-to-peer, so if you're at home, it happens at the speed of your home network. It will also keep your files in sync even if you're not at home, directly from your other computer, not through their servers. 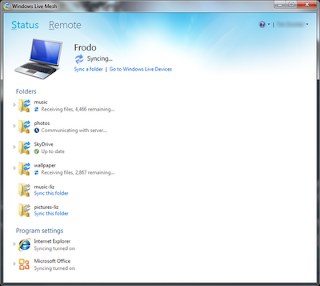 The management interface is pretty simple, though it's easy to miss the "Remote" settings, which allow you to connect to your computer over the Internet if you have enabled it on that device. 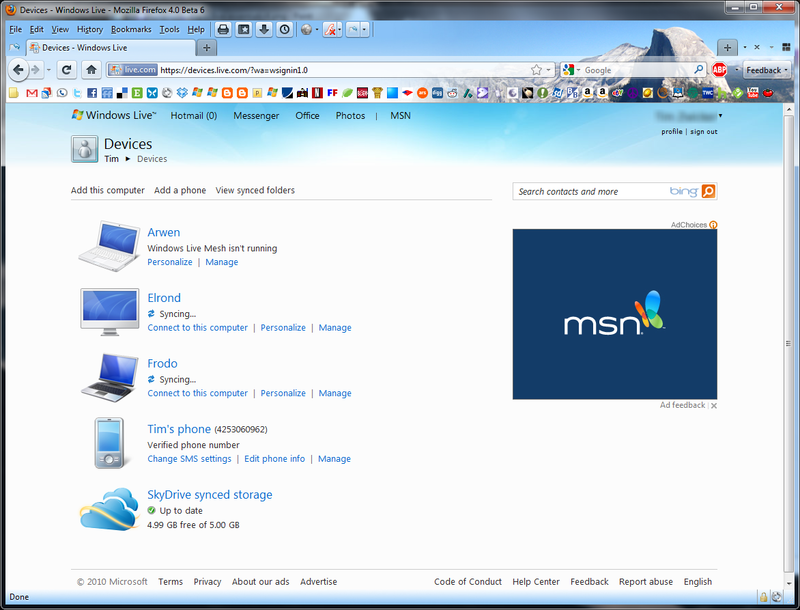 Connect is a lot like Remote Desktop, if you're familiar with that. Basically, it's just like you're sitting at the other computer. You have to be running MSIE on the computer you're connecting from. The web interface is a lot like the desktop interface, except in addition to your shared folders, you also have access to all of your devices as well, and you can see which devices sync to each of your folders. Update: After installing Windows Live Mesh on my wife's new netbook, she experienced extremely slow performance. Her netbook has a 2GHz x64 processor and 2GB of ram, so it wasn't simply the fact that it was a netbook that was making it slow. 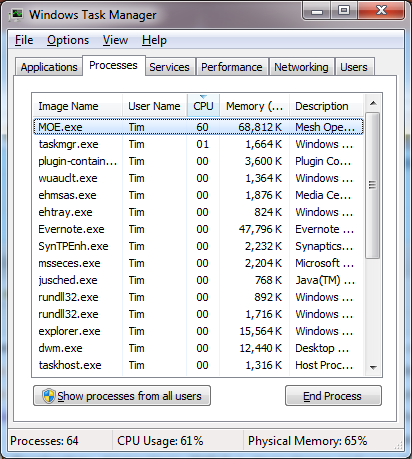 I opened Task Manager, and found that the MOE process ("Mesh Operating Environment") was consistently taking up 40 - 60% of the CPU. I shut down the process, and deleted the "Run" entry from the registry to disable it starting up automatically. Any syncing that happens will need Live Mesh to be started manually. I also observed similar behavior on my laptop, but the media PC (which is on all the time) has the MOE process taking only 3 - 5% of the CPU. It's probably checking the synced files for updates every time it starts up. 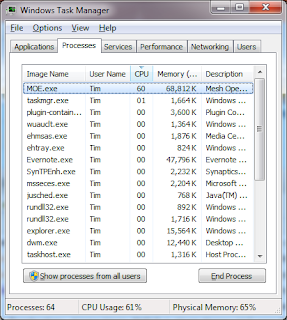 Anyway, be warned: Windows Live Mesh is a resource hog on machines that need to turn on and off all the time.